The Eye Foundation, a non-profit eye health organization, had a new CEO. She came to 2nd Road (the Sydney-based design firm where I was employed) to help her team construct a strategic plan for change, including a hypothesis for achieving their vision and mission. 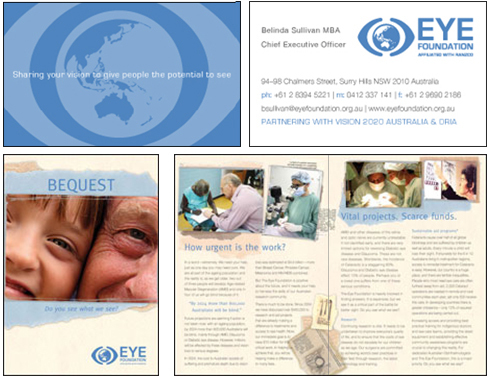 We then met with members of their target audience–professionals in the field of Ophthalmology–to test the hypothesis. The insight gained from research shed light on the many challenges facing the Foundation, but provided a strong direction for the communication strategy. Since the history of Ophthalmology was an important part of their identity, the creative concept incorporated illustrations of antique medical instruments and imagery to communicate the foundation’s desire to fund research and aide projects on a local and global scale. The new identity was launched at an annual congress, where they received rave reviews. Since then, they have formed several strategic alliances and funded a number of projects throughout Australasia. I conducted research interviews, led a workshop to debrief the research with the client, presented synthesized findings and collaborated with the designer, providing her with on-going creative direction–from logo development to content development for brochures.